Robert Winn (left) being congratulated by Joe Hall. The lodge was honoured by the presence of Joe Hall, Past Assistant Grand Director of Ceremonies, the principal guest representing the Provincial Grand Master Tony Harrison. Joe was accompanied the Chorley Group Chairman Peter Lockett, group secretary Don Hesketh and acting Provincial grand officer Mark Howard. The lodge was opened by the outgoing WM Kevin Taylor and after the usual business was conducted the members of the lodge balloted for a joining member, who was welcomed by all those present. 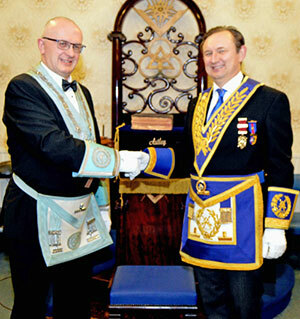 Kevin, assisted by his fellow lodge officers, then went on to install his successor in a most sincere and well- presented ceremony under the ever-watchful eye of the director of ceremonies Derek Whittle. The working tools were expertly presented by John Lancaster, Mark Briggs, Ian Smith and Andrew McMath and the addresses to the master and wardens by John Bicknell (a guest of the lodge) and John Rhodes. As tradition dictates the address to the brethren of the lodge was presented by the principal guest Joe Hall. Following the ceremony, Joe brought the greetings of the Provincial Grand Master Tony Harrison and commented on what an excellent ceremony had just been conducted making special mention of the secretary John Lancaster, the director of ceremonies Derek Whittle and Ian Smith (one of the more junior brethren) for excellent presentation of the second-degree working tools, a difficult piece of ritual. In response, the newly installed master Robert Winn presented Joe with a number of cheques for the following charities and good causes; Masonic Charitable Foundation 2021 Festival £500, Rosemere Cancer Trust £200, Derian House £100, St Lawrence Church Open Table £100 and Chorley Masonic Hall £600, totalling an impressive £1,500. On behalf of the Chorley Group and all those people not known to us who will benefit from these, Joe thanked the brethren for these very generous donations. Picture left: Robert Winn (left) and Kevin Taylor. Picture centre: Robert Winn (left) being toasted by Andrew Cogle during the master’s song. Picture right: Joe Hall (left) receives a gift from Robert Winn. The festive board was a very friendly and relaxed affair with good food and good company. Andrew Cogle proposed the toast to the WM and sang the masters song. The raffle raised an impressive £200. In response to the toast to his health, Joe Hall thanked the lodge and all its members for the wonderful reception he had received and commented on the excellent ceremony and festive board. Robert Winn (seated) flanked by Joe Hall (left) and Kevin Taylor (right) with guests and lodge officers.